Decepticon Flamewar has spent years preparing for the final battle against the Autobot Arcee. She has studied every one of her enemies moves, and devised a strategy to counter it. Now she waits, her weapons ready, for the unwary Autobot to wander into her trap. She stalks the Earth at the orders of the Decepticon leader Megatron, but every diabolical move she makes is carefully planned to draw her web even tighter around Autobot Arcee. Robot Mode: Flamewar is a straight-up repaint of Cyberverse Legion Arcee, but seeing as I don’t own that figure, this is actually my first look at the mold. And I must say that given the small size and the constricts of having to turn into a motorcycle (one of the more difficult-to-pull-off alternate modes), Flamewar is a pretty gorgeous little figure. 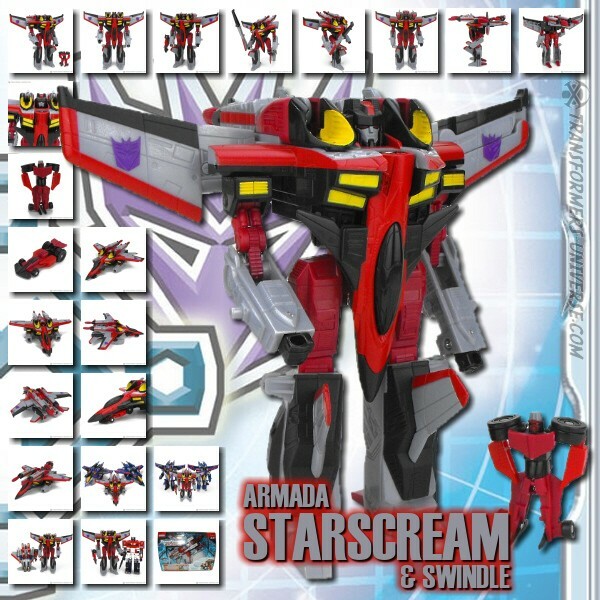 Imagining Arcee’s paint job on it, the robot actually has a fair bit of resemblance to the TV character and Flamewar’s black and red colours look pretty good on it. Articulation is also pretty good for the size. Flamewar as ball-joints at the shoulders and hip, as well as bending knees (not a given for Legion-class figures). The motorcycle kibble on her back doesn’t get in the way and she can easily wield her weapon (the same one the Cyberverse Vehicons carry) as either a sword or a gun, no problem. So bottom line: a very nice robot mode for the Cyberverse Legion class. Alternate Mode: Flamewar turns into a black and red motorcycle, no surprise here. The transformation is pretty nifty and the resulting bike offers little clue that there is a robot hidden inside. Okay, you can sort of recognize the robot’s feet near the rear wheel, but that’s the extent of it. You can mount Flamewar’s weapon on the sides or on top, but in the latter case you have to fire right through her windshield. So all in all a very decent vehicle mode, no complaints. Remarks: Flamewar was created for the Botcon Timelines comics, which portrayed her as a Megatron loyalist and true believer in the Decepticon cause in a time when the Great War was already over and the Autobots and Decepticons were in the process of being replaced by Maximals and Predacons. The Prime version of the character, however, seems to be more of the stalker type. According to her profile (which is the only character description she has in any media) she is obsessed with Arcee, apparently to the point of copying her body design. I bought Flamewar mostly for the name and to support one of the few big toy stores here in Germany who are not called Toys R’Us (the store has since closed, sadly). I have to say that she is one nifty little robot, though. I’m not a big fan of the Cyberverse figures myself, but I do like the idea behind them and Flamewar is well done. Certainly far from a must-have, but nice.